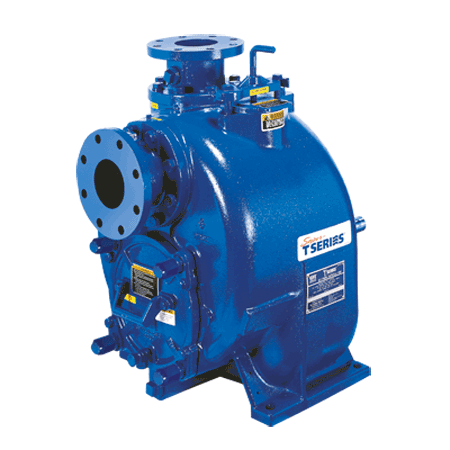 Designed for economical, trouble-free operation, the superior solids-handling capabilities of the Super T Series pumps make them ideally suited for a variety of applications including solids-laden liquids and slurries. The large volute design allows automatic repriming in a completely open system without the need for suction or discharge check valves. Available in discharge sizes of three, four, six, eight and ten inches, this line of self-priming pumps boasts capacities to 3400 gallons per minute (214.5 liters per second) and heads to 148 feet (45 meters). Pumps four inches and larger are engineered to allow up to three-inch diameter spherical solids to pass through any critical area, including the recirculation port. The external shimless cover plate allows for easy adjustment of the clearance between the impeller and the wearplate. This process eliminates the need to realign belts, couplings or other drive components. In turn, the working height of the seal assembly and impeller back clearance are not disturbed. The unique collar and adjusting screw allow for incremental adjustments of the wearplate clearance with the turn of a hand. Once adjustments have been made, the collar locks in place maintaining the clearance setting even if the cover plate is removed. This design doubles the life of the impeller and wearplate, and keeps the pump operating at maximum efficiency. Two-vane, semi-open solids handling impeller handles up to 3" (75 mm) diameter solids, depending on pump model. Pump out vanes on impeller shroud reduce foreign material buildup behind impeller and reduce pressure on seal and bearings. Multi-vane impellers are available in “B” hydraulics models for higher head applications with limited solids. Exclusive double-floating, self-aligning, oil lubricated mechanical cartridge seal with stationary and rotating face of silicon carbide or tungsten titanium carbide is specifically designed for abrasive and/or trash handling service. Seal is available on 3", 4" and 6" (75 mm, 100 mm and 150 mm) pump models. Optional seals are also available. The removable cover plate with "easy-grip" handle and pusher bolt capability provides quick and easy access to the pump interior without disconnecting piping. Clogs can be removed and the pump can be returned to service in minutes. Impeller, seal, wearplate and flap valve can also be accessed through coverlet opening for inspection or service. Inspection of pump shaft or bearings is easily accomplished without disturbing pump casing or piping by removing rotating assembly. Simply remove four bolts from the back of the pump and the assembly slides out. This allows for quick and easy installation of a spare rotating assembly, resulting in less downtime. An atmospheric barrier and two lip seals provide protection of the pump bearings. This allows for quick and easy external monitoring of the bearing cavity. Super T Series pumps feature replaceable wearplates which fasten to the cover plate and can easily be removed for inspection or serice. No expensive castings to replace.